Disclosure continue their reign as electronic crossover giants with their second set of finely crafted, star-studded house. 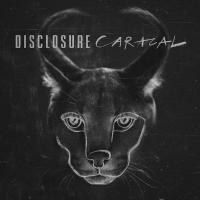 After the varied appeal of a debut like Settle, the more honed-in sensibilities of house duo Disclosure’s latest album Caracal might strike some listeners as an unnecessary deviation from what was already working so well. Electronic, pop, and indie tastemakers were all over Settle as an international and inter-genre smash, a breaking-down of barriers that were already crumbling for most of the last ten years. Looking at Disclosure’s surprisingly quick advancement into mainstream recognition and success after their debut, it makes more sense that they’d focus on the elements of their music that catapulted them there, and with the success of R&B-tinted singles like “Latch”, “F For You”, and “You & Me”, late night soul has become a defining element of Disclosure’s sound; consequently, Caracal is much more focused on vocal talent than any other component of its smoky, star-studded house, for better and for worse. Caracal’s best moments come from collaboration as a result. Gregory Porter’s relatively understated performance on “Holding On” doesn’t overtake the song’s built-in groove, making it one of the songs on the album where the balance between Disclosure’s signature warm, infectious beat-making and the complimentary presence of a guest star that doesn’t eclipse the music is strongest, keeping the song well-rounded and dynamic. Look also to the electrifying slow motion bump-and-grind of closer “Masterpiece”, the tone-setting dark energy of the the album opening “Nocturnal”, and Lorde’s well-regulated turn on the churning retro beat of “Magnets”: three less traditional dance tracks more representative of Caracal’s sad and soulful take on electronic pop. There are misfires as well. The Sam Smith-featured “Omen” comes off as a too-familiar sequel to their more effectual pairing on Settle’s hit “Latch” -- both of which share a more pronounced pop orientation than their respective albums as a whole -- but “Omen”, slower and funkier, does give Smith welcome space to show off his stirring soulful energy, lending a jolt of star-driven vitality to the dark early part of the album. Miguel is also put to poor use on the downtempo “Good Intentions”, which sees him unable to utilize his unique melodic prowess and instead locked into a feeble and monotonous verse-chorus structure. Despite these and similar lesser moments, Caracal doesn’t suffer much; each of these songs fit well into the framework of the record, and even if they sometimes misuse the available talent, it’s another virtue of the record that none of the guest stars overshadow its ultimate spirit. That’s the real takeaway. Caracal has no party-starting house hits with retro-styled universal appeal that “When A Fire Starts to Burn” brought to their first album, even when the guests take a break and let the duo hold their own: “Jaded” is an understated retread of the same pop-house formula used across the album and “Echoes” is a similarly modest momentum slower. “Bang That”, the funky, sample-heavy pre-release single that also happens to be the closest analogue to the dance floor hype-up of “When a Fire Starts to Burn”, only appears on the iTunes deluxe version of the album, confirming a dramatic shift in Disclosure’s artistic priorities. Of course, a club banger with the plain and direct sexual messaging of “Bang That” wouldn’t really cohere with Caracal’s lush set of emotional R&B ballads, and even if it found its way on the album, critics would still reprimand the group for repeating themselves. Whether it’s to your tastes or not, Caracal is a well-developed and meticulously constructed record -- something for which we can continue to depend on the duo. Caracal isn’t much of a club-banging set, and its narrow tone is damaged by a broad and uneven guest list that spans wildly between today’s biggest music stars and relative unknowns. Its seductive, late night R&B slant keeps Disclosure safely locked into the pop sphere while simultaneously diminishing their once-solid indie cred and slightly distancing themselves from their more electronic-attuned fanbase. That said, Caracal offers the same slick production value and luxury grooves that made Settle a crossover phenomenon, so even if you don’t find yourself enamored with the more narrow direction Disclosure have taken their finely crafted sound, you still might find yourself dancing along.